Lewis Hole struck twice to give Little Common a 2-0 win away to Shoreham. 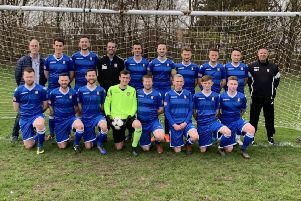 A brace of goals from Lewis Hole gave Little Common a perfect start to life in the Southern Combination Football League Premier Division. The Commoners began the 2018/19 season with a 2-0 victory away Shoreham - who were playing two levels above them last term - yesterday (Saturday). Common included two new faces in their starting line-up, with Sam Willett and Kane Penn coming into a squad comprising mainly of those who had helped the club to the Division One league and cup double back in April. On a blistering hot day, the Commoners were unsure what to expect against opponents who were playing in the Bostik League last season but nevertheless began the match in a positive fashion, passing the ball well and keeping possession for long periods of the opening quarter. Neither goalkeeper was called into action in the early stages and it was the first effort on goal which broke the deadlock in the 11th minute. A Wes Tate corner flicked off the head of Ryan Paul before landing at the feet of Hole on the edge of the area. The Common hitman took one touch before firing a superb effort back across the goal and into the top corner of the net. Common may have expected an onslaught from the home team as they looked for a way back into the match, but it never materialised and the Common defence coped well with the aerial presence of the Shoreham front line. Common came closest to adding to the scoring, firstly through a Russell Eldridge free kick which just cleared the crossbar before a lovely passing move released Jamie Crone in the area but Hole was unable to sweep home his cutback. As expected, Shoreham came out with more impetus at the beginning of the second half but without really troubling Matt Cruttwell in the Common goal. A free kick flashed wide of the far post and a well-timed Paul interception prevented a home striker from getting a shot away as he bore down on goal. Arguably the turning point of the afternoon came on the hour when the hosts were reduced to 10 men following two yellow cards in quick succession for the Shoreham striker. Growing in confidence, the Commoners were able to revert back to their passing game and enjoy longer spells of possession. They almost doubled their lead in the 70th minute when a sweeping move saw Hole unable to connect fully with a delightful Paul delivery into the box. Shoreham had a rasping effort beaten away by Cruttwell low to his right before the match was all but sealed 10 minutes from time. Penn’s delivery into the area was controlled by Hole, who then applied a calm finish into the bottom corner of the net. Common saw out the final minutes without too many scares to clinch their first points of the season and first ever in the Premier Division. Common: Cruttwell, Paul (Ryan), Parsons, Ward, Willett, Eldridge, Tate, Penn, Hole, Crone (Ellis), Smith (Maynard).